SEE THE MOST UP-TO-DATE INFORMATION ON THE STORM HERE. A powerful nor'easter began barreling into the tri-state Friday night slightly ahead of schedule, and Storm Team 4 says it has picked up in intensity and speed, enough to become a potentially paralyzing blizzard with blasting winds, heavy snow and coastal flooding for a wider portion of the area than previously thought. Storm Team 4 now says the heaviest snow is expected between 4 a.m. and 4 p.m. Saturday, with increased project snowfall totals for much of the area. The storm is "bombing out," Storm Team 4 says, meaning the pressure in center of the storm is dropping rapidly, a sign of a very intense nor'easter. That center of the storm will dump 2 to 3 inches of snow per hour when it moves through the tri-state Saturday morning and into the afternoon (see forecast video above for more on bombogenesis). Blizzard warnings are in effect for all of New York City, Long Island, large swaths of New Jersey, parts of southern Westchester and coastal Connecticut from Saturday morning until Sunday afternoon. A blizzard is defined as a wintry storm lasting longer than 3 hours with visibility below a quarter mile and winds gusting above 35 mph. Snow started falling across southern New Jersey and the Jersey Shore Friday evening, and by about 10 p.m., flakes were falling steadily in Manhattan and other parts of New York City, moving in slightly faster than expected. Winds will pick up overnight, and by the time most tri-staters wake up Saturday morning, several inches of snow will already be on the ground. 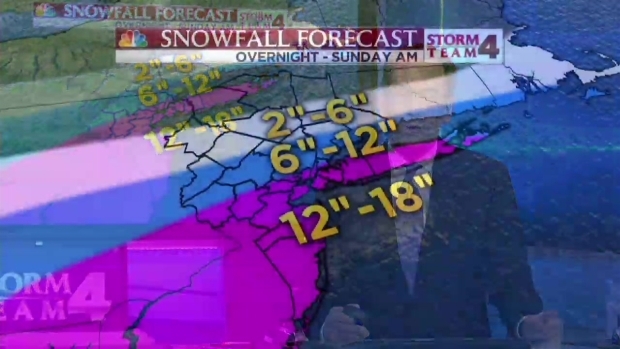 Storm Team 4 says it's now projecting between 12 and 18 inches of snow will fall on the areas under a blizzard warning. Some isolated parts within the region could even get up to 20 inches of snow. The lower Hudson Valley is also now expected to get about 12 to 18 inches of snow. Areas slightly further north will get 2 to 6 inches. Above that, in the far northern reaches of New Jersey and New York's upper Hudson Valley, only trace amounts of snow are expected. Conditions will worsen as the day progresses, with damaging winds combining with heavy snowfall making for limited visibility. Perhaps more dangerous than the snow is the cocktail of snow, astronomical high tides and a wind-swept storm surge that could cause significant coastal flooding and beach erosion on the Jersey Shore and parts of Long Island. Waves topping 15 feet may also batter beaches built up with protective sand berms. Winds topping 60 mph could also down trees and leave homes without power. Several towns along the Garden State’s coastline asked residents to leave their homes on a voluntary basis earlier Friday; Barnegat has ordered mandatory evacuations on one street. The region isn’t expected to be hit as hard as the nation’s capital, where nearly 30 inches of snow could fall, but it’s not one that officials are taking lightly. Mayor de Blasio has declared a "winter weather emergency" ahead of the storm, and has urged drivers to stay off the roads after 8 a.m. Saturday, and warned New Yorkers that vehicles blocking plows and emergency vehicles will be towed. "Get done what you have to get done today," de Blasio said. 'Do not bring your vehicle out tomorrow." This weekend's winter weather emergency is different from the travel ban instituted ahead of a forecast blizzard last January. De Blasio said this storm shouldn't be taken lightly, but it doesn't look like the storm will have the same potential impact as the one that forced the MTA to shut down the city's subway system last year. "The city is fully prepared," de Blasio said. Gov. Cuomo, meanwhile, said that the state is ready for the storm, which he said was "not the worst forecast we've ever had." He said salt spreaders and plows are ready and that 600 National Guardsmen are at the ready. Gov. Christie, back in New Jersey from the Republican presidential campaign trail in New Hampshire, has also declared as state of emergency in New Jersey. He's authorized NJ Transit to halt service at 2 a.m., and has ordered Motor Vehicles Commission offices closed on Saturday. Christie and Cuomo both pleaded residents to stay off the roads. "One of the greatest burdens becomes stuck vehicles or stranded vehicles," Cuomo said. "You don’t just endanger yourself, you endanger the emergency personnel who come out to help you."